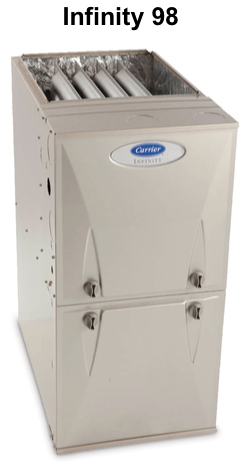 In most new homes, gas furnaces have become the standard. This furnace is powered by natural gas or propane. Once the temperature of a house falls below a certain level that is controlled by the owner, gas begins to flow and the ignition system ignites it. Now the gas is hot and combusted, rising past a heat exchanger and to the outside of the house. As the air passes the exchange, the motor of the furnace pulls air from it. That air then flows through ducts and into the plenum. Then more heat from the combusted gas warms the air. The warm air then goes back into the house through ducts that goes into vents. The vents lead to the rooms, heating the house. Why isn't there any heat? A control valve is closed. A pilot light is out. There's an incorrectly set or faulty thermostat. There's a defective circuit or fuse. We open the control valve to allow gas flow. Then we adjust or replace the circuit or fuse to get the power back. If needed, we'll reset or repair the thermostat, light the pilot flame again or replace the air filter. Why isn't there enough heat? The blower is blocked, loose or damaged. The burner or filter is too dirty. The thermostat is set too low. We'll clean or restore the blower, burner or filter depending on which part is impaired. If the problem is with the thermostat, we'll raise the temperature setting or fix it. The motor or blower being overly dry. We'll clean the port or proper parts to let clean air flow through. If the problem lies in the thermostat heat anticipator, then we'll reorient the adjustment arm accordingly. A closed or insufficiently open valve that hinders the flow of gas. The pilot flame is set too low. The thermocouple nut is loose or damaged. A dirty orifice or gas tube. We clear the blockage or congested pilot opening, then try to light the flame. If it doesn't come/stay on, we'll raise the pilot flame. We'll also tighten up the thermocouple or replace the whole thing. Why is my furnace making so much noise? High pitch sounds may mean that the bearings need oil or the belt is slipping. A low pitch noise probably means that the pilot light needs to be adjusted or the gas burner is dirty. For high pitch sounds, we simply oil the bearings. If it's a blower or motor belt problem, then we'll replace or tighten it. For low pitch noises, we'll adjust the pilot flame and clean the gas burner. Why is my blower continuously blowing? The fan setting is set on continuous. We can switch the settings of the fan from continuous to auto. We can replace or reset the control limit switch. If you have any of these problems, let us know! We are available when you need us!